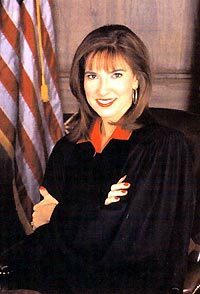 Court is in session and Judge Marilyn Milian, the first female and the first Hispanic to serve on TV's The People's Court, is presiding. This take-no-bull judge is feisty, confrontational, and witty. Milian has been on the bench for sixteen years. She was appointed by Janet Reno to serve as Assistant State Attorney for the State Attorney's Office in Dade County, Florida. Later, Governor Jeb Bush appointed her to serve on the Miami Circuit Court Criminial Division. Here, she steps down from the bench for a few moments to discuss her appreciation of life, sunrises, and why she needs a pinch. Las Vegas with my family. I would buy a beautiful house on the bay in Miami so I could see the incredible sunrise every morning. Whatever was left over I would spend on traveling around the world. I lost a very close relative to AIDS-related complications. You can read and feel empathy, but when it hits your own family it is even more devastating. My father. He is the embodiment of determination in over coming obstacles ranging from Cuban communism to poverty. Do you think there should be condom distribution in the high schools? Yes, It's a safety issue. It has made me realize how short and precious life can be. I'm sorry, but we're running out of space here. Okay, being impatient. Mark Twain, the greatest wit who ever lived. I love several; Tommy Lee Jones, Samuel Jackson, Johnny Depp, Sally Field, Sophia Loren.